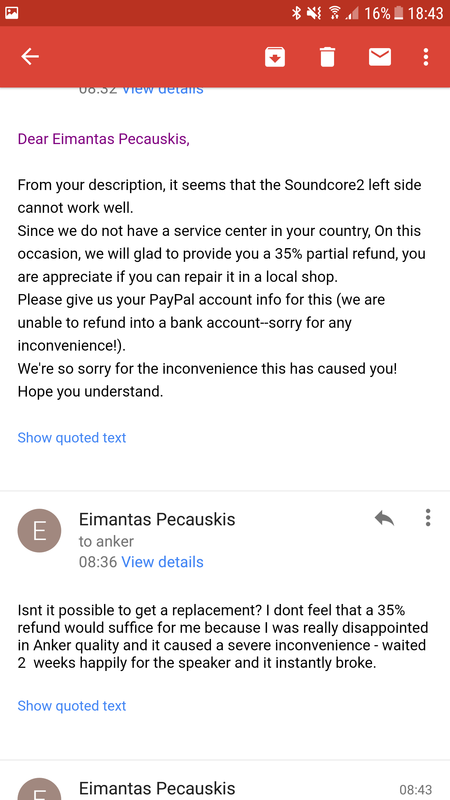 First of all, I have already raised a support ticket for a defective Soundcore 2: Ticket#92546452. I ordered it from Aliexpress. I received it and it was working flawless for about 4 hours and then the left driver started making a pretty loud crackling noise and finally it stopped playing my songs, only crackles. 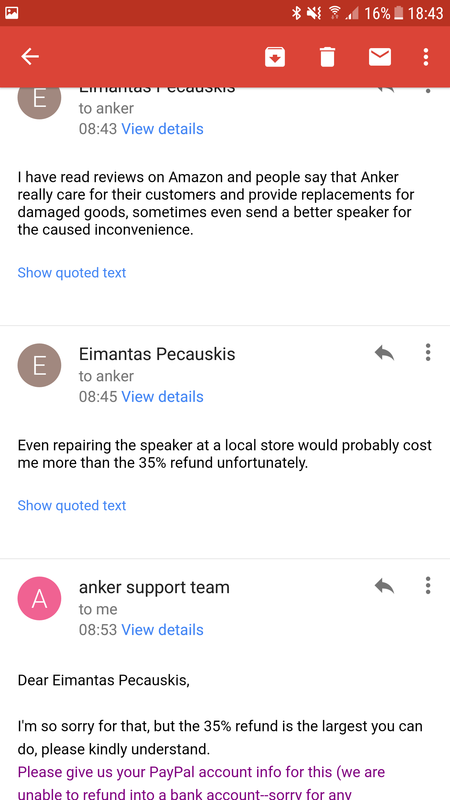 I heard a lot of praise from reviewers about Anker Support but they have really disappointed me. I presented all the proof and was very polite but I was only offered a 35% partial refund which wouldnt even be enough to repair it at a local store... I asked for a replacement and was told this was the only option. Seems all the good reviews about Anker Support are fake or misleading or the person helping me is not helpful enough. Very disappointed in Anker quality and probably wont buy again since ive got a product that broke almost instantly after waiting 2 weeks for delivery and all the hype I had for it. 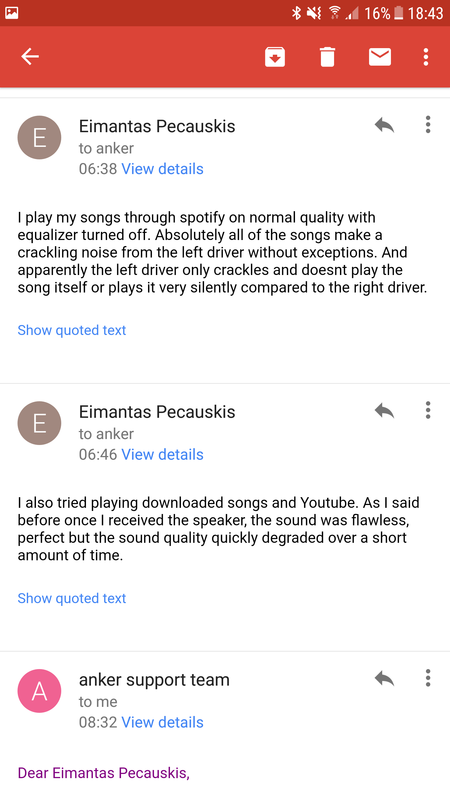 Hi @Eimantas_Pecauskis1 , sorry to hear of your issues with your SoundCore 2. 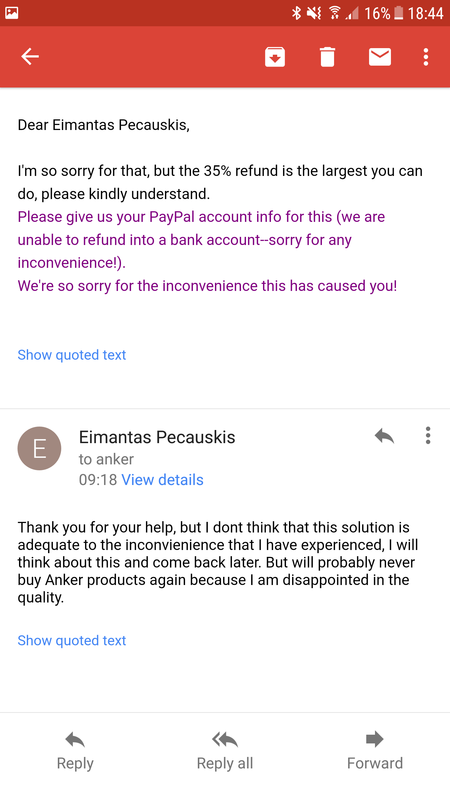 When you say you raised a support ticket, did you do this via Ali Express or support@anker.com? I must say it does seem weird how you would have only been offered a partial refund for a defective item, most are fully refunded or replaced (based on my past experience's and reading of others). I've tagged @AnkerOfficial into this reply who hopefully maybe able to assist further with your issue. I wrote to support@anker.com since the Aliexpress seller Anker Official Store redirected me to them. But I was disappointed in the resolution. Hopefully I will get better quality help soon. Thank you very much for the reply @ndalby. 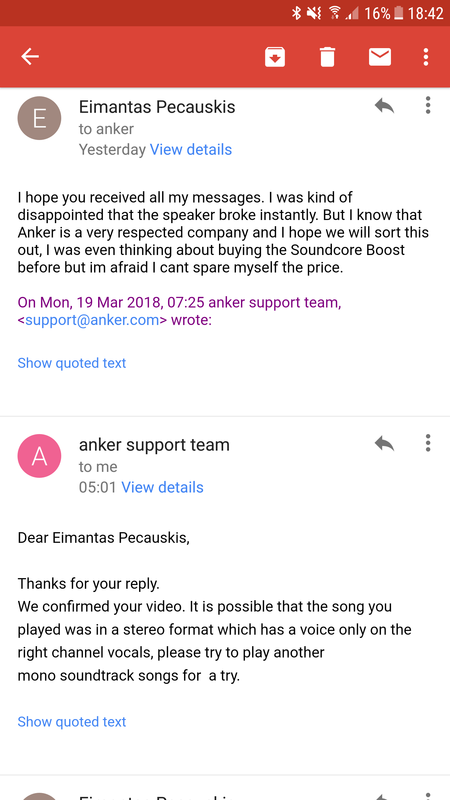 And yes I did notice that most people really praise Anker for quality products and their helpful support team, sometimes even getting a better speaker for the inconvienience caused by a defective Soundcore or Soundcore 2 but so far I am having a bad experience. The crackling noise is best heard at 0:17-0:18 and in the middle of the video I put the left driver under the microphone of my phone - song is played only through the right driver, the left one only makes the crackling noise. Just to clarify that I am not somekind of deceitful person hunting for free speakers. @AnkerOfficial could you help me out? Sorry to let you wait so long, since received your message, I've been communicating with our related departments. Please note: the product return policy on Aliexpress is different from Anker store and Amazon. So if you received a low quality product, we can only handle it according to the AliExpress return policy. If you are not satisfied with partial refund, we will contact you again and give you a full refund in accordance with the first treatment. We're sorry about the unique problems you’ve been experiencing with our products. We will try the best to resolve the issue for you. Thanks for the reply, as I said a 35% refund does not satisfy me but I dont think I can return the item since the shipping and customs costs might be very expensive. Also is there a way to order Anker products from somewhere where I can actually get better help than Aliexpress? I cant order from amazon because they dont ship to my country. Got it, our customer representative will contact you again within three working days. Hope you will satisfied with the final results. Thanks for your help, hopefully we will sort this out. Thanks, ive got contacted and granted a full refund and now I am waiting for the refund to come after 3-15 days. Might buy the Boost when the anniversary sale starts. Hopefully wont run into any problems :). Glad to hear things have worked out. Glad it worked out. I too gotten some more trust from anker. Yes indeed, sometimes it is necessary to be rather pushy.